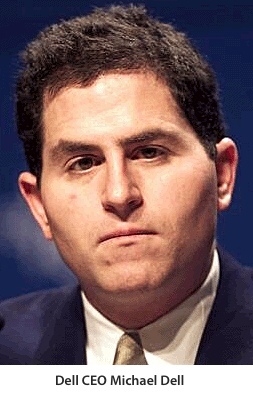 “Michael Dell kicked off the process to take Dell Inc. private. Now as other potential bidders crowd into the picture, Mr. Dell may end up losing control of his company,” Shira Ovide reports for The Wall Street Journal. MacDailyNews Take: Here’s a better idea: SIDAGTMBTTS. Cool idea (back in tha day) that has run it’s course. cool he gets fired then comes back 20 years later and makes the greatest company on earth.. or not. The difference between Steve Jobs and Michael Dell is Dell came back to (inadvertently) KILL his company. Nice work ‘ol crossy-eyes! None better for the job. Maybe he can replace Ballmer at M$. Both have business credentials in devaluing a company. if someone isn’t careful, DELL may be turned into another HP. Who the hell cares about what happens at Dell? Beleaguered Apple is not taking advantage of the beleaguered Dell anyhow so what difference does it make if MSoft is gaining or losing or going sideways? Nothing is happening in either the Apple or the MSoft universe thanks to the once great Apple now dead in the water. Can’t wait to see silverhawk1’s repeat keys of p’s with the occasional, boring charge of “troll” dropped in. I am not a troll Mr. Silverhawk1 but what you are not is any form of intelligent. Already tired of masturbating this morning, eh, pee? Because this is Schadenfreude at its best! After years (decades) of unrelenting pressure by Dell to war against Apple, Dell lost. And the constantly-improving quarterly financial reports by Apple in the face of worldwide economic disasters is a wonder to behold! Apple products are still great (and incrementally improving even though still at about 85% “perfect” – and never 100%) and not at a stand-still. That was quite a douchey post pp. Pete Peterson is the chairman of the Blackstone group, one of the potential buyers of Dell, and, next to Charles Koch, the biggest douchebag in the country. That post was satire, not trollery. I for one happen to care what happens at Dell and a lot of people here do as well, including cognativedisonance who gave a very nice reply. Dell being in the position they are in has most definitely been taken advantage of and you go through MDN to see the listing of every time Apple is worth X times more than Dell. It’s a lesson to others. At the time dumb Dell actually thought that the once great Apple now dead in the water and he will be reaping the consequences for a long time to come. From the way you are posting I’d say you are looking to join the ranks of dumb Dell and “he’ll never post here again Zune Thang”. I hope you fully understand the severity of what entity you are most likely dealing with, since you seem to be advertising the realm somewhat since your return. Making a deal with the horned one will get you your 15 minutes of fame all right, followed by an eternity of shame. Get some help before it’s too late. I’d shut it down and give the money back to the shareholders” — Michael Dell, Oct. 6, 1997, when asked what he would do if he ran Apple. My first computer was a Dell. The laptop my university gave me is a Dell. It would feel a bit sad to see Dell disappear. I can’t wait to get a job and by a new Mac though. My heartfelt sympathy goes out to your painful computer history. We will be here and happy to welcome you over from The Dark Side on your future purchase. Dell always made junk. I am surprised it lasted this long. People ask me about Dell and that is what I tell them. I tell them to go Apple. Most companies on this planet make junk, often intentionally because a short-sighted consumer is too cheap to invest in durability. By your assessment, should all low-cost manufacturers be shut down? Not a bad idea actually. America seems hell-bent on filling its landfills with disposable cups & eating utensils because people are too lazy to load a dishwasher. How’s that for stupid long-term planning? Here’s a new image that MDN is free to use whenever an article with Michael Dell is in it (it needs some retouching work)… enjoy! Yeah, but who in their right mind would actually buy that crapfest company? You gotta be a full-on stupe nagel to do that.